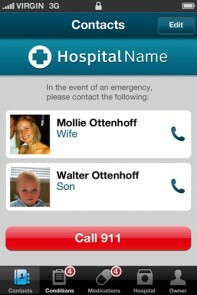 There is no way for a smartphone to indicate who the owner wants contacted in case of an emergency (ICE), or even what medical conditions and allergies he has that could affect his care. In fact, if the phone is locked, it’s practically worthless. That’s why smartphone users need our ICE app. 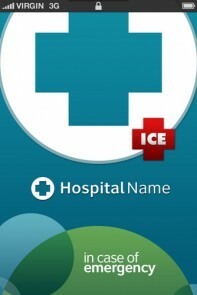 By customizing our ICE app with YOUR brand and offering it to your patients, you will be providing what could be a life-saving service while placing your brand on the home screen of every user. 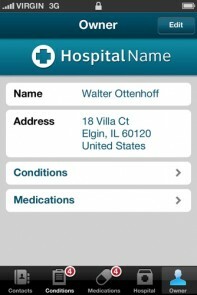 Click the buttons below to learn how valuable this app can be for your patients and organization. Once we have your logo and color palette, we redesign the screen that launches the app so it is YOUR app. Your brand is front and center whenever the app is launched so that it is powerfully associated with what very well could be a life-saving tool. This Launch Screen then moves automatically to the Owner Screen for the user to begin inputting the important information that will fuel the app’s purpose. With your logo at the top, this page shows a list of those whom the owner wants contacted in case of an emergency. Simply pressing the name will activate a phone call to that person. The name, phone number and relation of the Primary Contact then gets displayed on the Lock Screen so emergency personnel can know this information without having to unlock the phone. Every time users operate their phones, they will see your brand and connect you to this life-saving tool. Plus, without needing to unlock the phone, any person can see who the user wants contacted in case of an emergency (ICE) because the information is right on the lock screen. 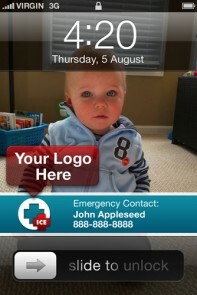 The Lock Screen also tells emergency personnel that there’s an app inside the phone that has more valuable information about the owner of the phone. Notice that your brand is featured at the top of all screens. In the “Owner” screen, users simply enter their contact information and then click on “conditions” and “medications” to edit their list of each. It’s always wise for caregivers to know as much as possible about the patient before administering care. 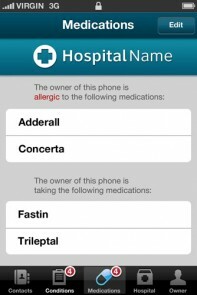 This app not only displays a list of medications the user is taking, but also a list of those to which the user is allergic (all selected from a database that can be modified by the user). Communication is critical. And this app allows the user to communicate with caregivers even if the user cannot talk. 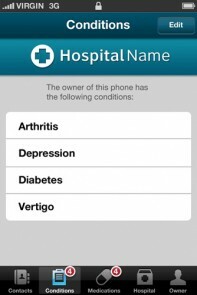 This screen lists all of the medical conditions that the user has added from the app’s list. The goal is to make emergency personnel aware of any potential complications they may experience while providing care to the user. There are two ways people can find your facilities: List View and Map View. Here is how your locations are presented in a list. We use the information you supply to fill this page for you. Clicking on any location brings you to a more detailed page where you can directly connect via phone. The list of locations you provide to us is used to feed a map. Simply clicking on the icon takes users to a more detailed page of that location and allows them to call directly from the app. Find out what our clients are saying about this extraordinary app. Sherman’s ICE App is an invaluable tool for people to have on their phones in our increasingly mobile cultures. It can save emergency responders valuable time should the need arise. There’s simply no reason not to have it loaded on your phone. I really like the way they've set up this app. Simple, easy UI. Does what it needs to do. 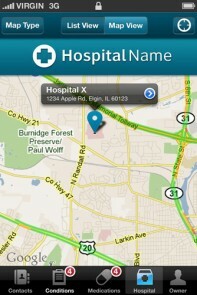 However, the "hospital" tab, naturally only shows hospitals in the "Sherman" network which is fine if you live in Illinois. I live in Mass and want to be able to edit the hospital info. Haven't figured out how. I realize there are other ICE apps on iTunes, and I have tried several, but this one seems to work best for me. Would love it if the developers would either make a generic ICE app or make this one a bit more customizable. 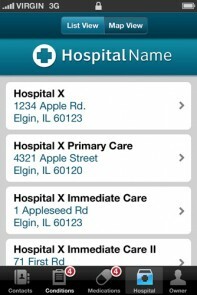 © 2019 DC Interactive Group | ICE App for Hospitals, Healthcare, iphone, droid. All Rights Reserved.